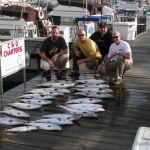 Wisconsin's best Lake Michigan Salmon fishing from the scenic Port Washington marina. 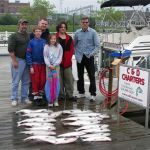 Welcome to Port Washington Wisconsin, where you will have an unforgettable charter fishing experience. 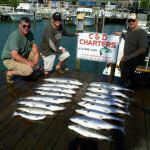 Port Washington charter fishing ranks among the top Wisconsin King Salmon charter fishing ports. 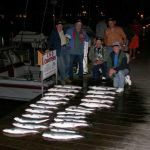 Lake Michigan provides May and June Coho salmon, Chinook salmon and Steelhead fishing that will lead into monster king salmon fishing in July, August, September and October. Capt. Chad has been fishing Lake Michigan off the Port Washington breakwalls and off of friend’s boats since he has been 3 ft. tall. He purchased his first boat in 1996 which he moored in the Port Washington Marina. Capt. 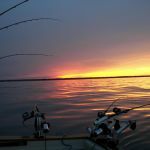 Chad earned his captains license in 2001 and started C&D Charters the following year to share his love of Lake Michigan fishing with others. The off season keeps him busy enjoying spending time with his wife and 2 children, working on his 2 boats, hunting and fishing. Capt. Trav was born and raised in Port Washington, which fueled his love for fishing. While fishing Lake Michigan in his 17 ft. Glastron throughout high school was fun, he knew he wanted to do more with fishing once he graduated from college. Travis graduated from UW-Platteville and got his captains license in 2014. 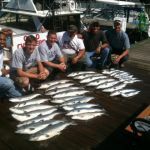 He has enjoyed taking customers out on fishing charters ever since. When Travis isn’t wearing his captain hat, he wearing his teacher hat – teaching high school tech ed. He enjoys spending time with his wife and two dogs doing anything outdoors – especially their daily dog park outings. “HOOKED-UP II” is a 41 foot Sea Ray Sportfish Sedan Bridge which offers a huge back deck, private restroom and a spacious heated and air-conditioned cabin. “HOOKED UP II” is fully equipped with color radar, chart plotter GPS, high power sonar, autopilot and 30 top of the line rods & reels. “HOOKED-UP” is a SeaRay Sportfish Sedan Bridge that is 41 ft LOA and 14 ft wide. It offers a huge back deck, private restroom and a spacious heated and air conditioned cabin. “HOOKED-UP” is fully equipped with color radar, chart plotter GPS, high powered sonar, autopilot and 30 top of the line rods and reels. Base Trips are priced for 1 – 6 passengers. ** Wisconsin sales tax not included.